Meets the requirements of ISO 10993-1:2009 Biological Evaluation of Medical Tables and passes testing for Cytotoxicity, Skin Irritation and Sensitization as well as CA TB117 Fire Retardance testing. For disinfecting purposes you may use Protex, MadaCide, MadaWipe, Accell TB, Virox® (Canada), PDI Duper Sani-Cloth Germicidal wipe or a diluted 1/10 bleach solution. 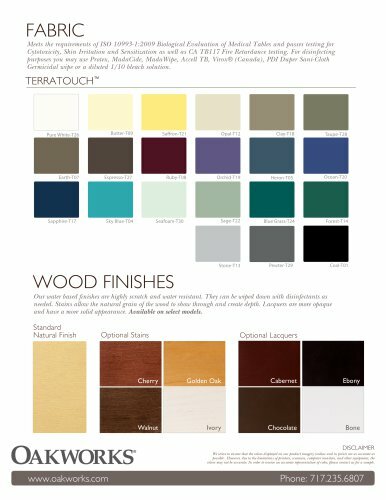 WOOD FINISHES Our water based finishes are highly scratch and water resistant. They can be wiped down with disinfectants as needed. Stains allow the natural grain of the wood to show through and create depth. Lacquers are more opaque and have a more solid appearance. Available on select models. Standard Natural Finish Optional Stains Optional Lacquers Bone DISCLAIMER We strive to ensure that the colors displayed on our product imagery (online and in print) are as accurate as possible. However, due to the limitations of printers, scanners, computer monitors, and other equipment, the colors may not be accurate. In order to receive an accurate representation of color, please contact us for a sample.